The song 'Gangnam Style' holds the Guinness World Record for the most 'liked' video in YouTube history. Gangnam Style has been "liked" over 2,141,758 times since it was uploaded three months ago. So, it's safe to say, it's a pretty popular video. The song is everywhere. South Korean rapper PSY (real name Park Jae-Sang) has a signature style of dancing. It's kind of like he's riding an invisible horse. I noticed there's someone else that rides an invisible horse. 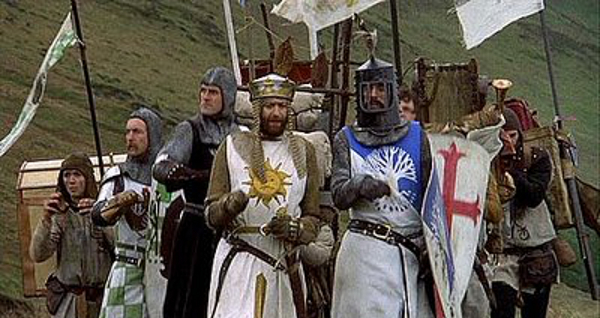 It's the cast of Monty Python in the movie Monty Python and the Holy Grail (1975). So, here you are. I took the most popular YouTube song "Gangnam Style" and added the cast of Monty Python. I hope you like it. If you do like it, then please "like" it. I would like it. Here's the original, in case you haven't seen it. What do you think of the video? Who do you think did it first? Who do you think air-ponies better? Star Wars Sings "Call Me Maybe"
I had not seen the original video, so watched them both. I love Monty Python, so I have to vote for them. But I really enjoyed the rap video, too. It was a lot of fun. I tried to sneak in some Python references Tony. Glad you liked it. Python makes everything great. Thanks for following us on Twitter Alex! I just wish it would have been a little longer with a couple audio clips mixed in....yes I am greedy! I watched it not long after it was uploaded. Agree with Tony - Monty Python makes everything better!!! There's so many references I could make explaining that song. But I will only say this: Monty Python's Holy Grail makes everything better! That song may be everywhere but I still haven't heard it yet. And I'm not planning to start.